Sadiq Khan’s Address to Lahore City Councilors! A few days ago I happened to come across a column by Dr. Safdar Mehmood in which he had tried to impress upon the common people of Pakistan about the excellence of Quaid-e-Azam’s companions during the Pakistan movement. In this very column he tried his very best to reject the statement which is often referred to as saying of Quaid-e-Azam that he had some counterfeit coins in his pocket and all he did in third fourth of his column was some frothy eloquence and verbose. Only in the last paragraph he referred to some book and gave his opinion while I was expecting him to state some statement of Quad-e-Azam in favor of his companions (mainly, Liaquat Ali Khan) but he didn’t. I have no argument about this statement of coins was uttered by Jinnah or not. But there are some statements recorded by the historians which expound the deteriorating nature of relationship between Liaquat Ali Khan and Quaid-e-Azam, especially in the last days. This was the time when Bengal was suffering from severe famine and there was a tension between Congress and Muslim league regarding formation of Government in the center. Jinnah and Gandhi both were aging, younger leaders of Muslim League and Congress, Liaquat Ali Khan and Bhulabhai Desai respectively, met and allegedly agreed on a ‘formula’ for “Interim Government at center”. According to this formula Muslim League and Congress were supposed to gain 40% share each in the cabinet, whereby 20% was the share of Sikhs and Untouchables while keeping Viceroy and his Commander-in-Chief as British. Stanely Wolpert writes, “but it remained unclear whether or not Liaquat ever actually discussed this matter with Jinnah”. In January 1945, Jinnah in an interview with Associated Press notified, “There is absolutely no foundation for connecting name with talks which may have taken place between Nawabzada Liaquat Ali Khan and Bhulabhai Desai”. Here one is coerced into pondering as to why Jinnah would refute, Liaquat Ali Khan’s claim or as to why Nawabzada would indulge himself into talks with a Congress leader without taking Jinnah into confidence. 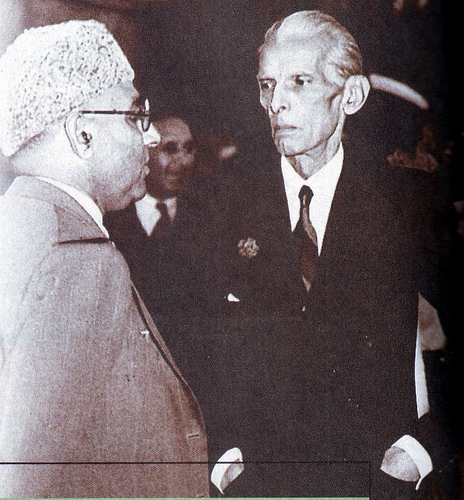 After the birth of Pakistan, Jinnah wanted to see his infant nation progressing but was not happy with his Prime Minister’s Performance that during lunch with CM Sindh MA Khurhu, he pronouced Liaquat Ali Khan as “mediocre”. Upon hearing that Mr. Jinnah had been criticizing Liaquat Ali Khan, through her wife, Liaquat Ali Khan tried to tender resignation in February 1948. Also when Liaquat Ali Khan visited Quad-e-Azam Muhammad Ali Jinnah in Ziarat, he asked Fatima Jinnah if she knew as to why Liaquat Ali Khan visited him? “he wants to know how serious my illness is and how long will I last”. Jinnah had similar trust issues and expressed his disgust for wit h his other companion, Nawab of Madot, the then CM of Punjab. Jinnah asked Mian Mumtaz Daultana to take control of Punjab Ministry but Daultana refused. Jinnah was very angry on this. Quaid’s 11 August Speech – Why the debate? 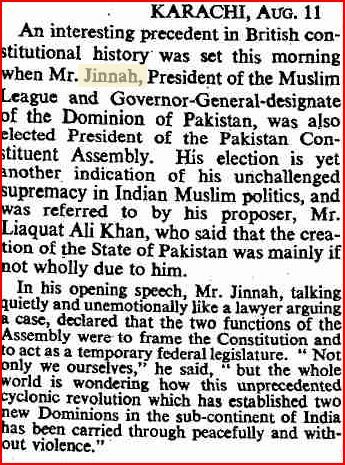 There a pandemonium in Pakistan over non-existence (or existence) of Mr. Jinnah’s speech, in the print media. The group who is denying the existence of utterance of such words as to allow minorities the full freedom, choosing English as an official language and which expounded the nationalism, has its ulterior motives and a particular ideology, viz., Quaid e Azam Muhammad Ali Jinnah was a chosen person by Devine Authorities and was a votary and he never wanted any political system other than the divine one. 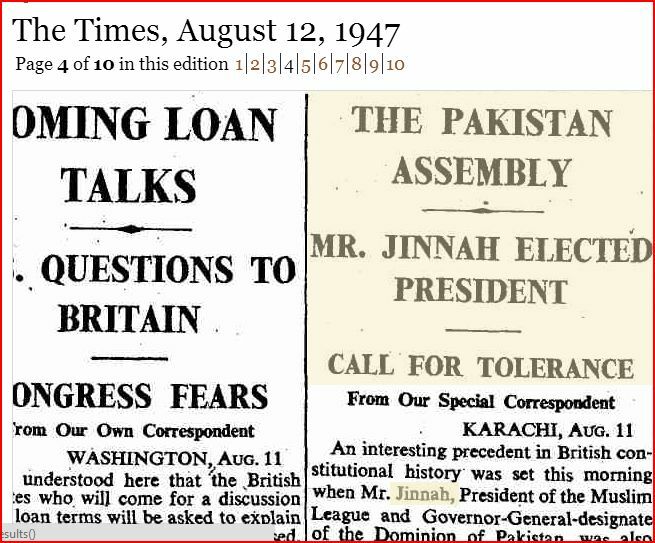 Below is the exact news as it appeared in the Daily Times (England) on 12th August 1947 insofar Mr. Jinnah’s speech of first constituent assembly is concerned. I will put the statements regarding rights of the minorities, political system and official language in bold. Readers can draw the inference from the below self explanatory piece from History. The first duty of the Government, he added, was to maintain law and order so that life, property, and religious beliefs were fully protected by the State. He then proceeded to inveigh against bribery and corruption, nepotism and jobbery and black marketing. With regard to the division of India he said that there were many people in Pakistan and India who did not agree with it, but he himself was convinced that it was the only solution to India’s constitutional problem. 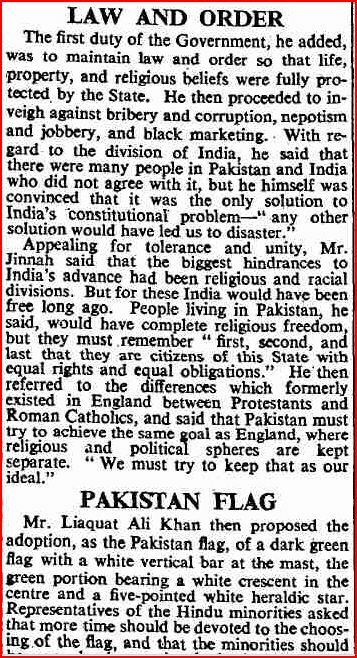 “any other solution would have led us to disaster.” Appealing for tolerance and unity, Mr. Jinnah said that the biggest hindrances to India’s advance had been religious and racial divisions. But for these India would have been free long ago. People living in Pakistan, he said, would have complete religious freedom but they must remember ” first, second, and last that they are citizens of this State with equal rights and equal obligations.” He then referred to the differences which formerly existed in England between Protestants and Roman Catholics, and said that Pakistan must try to achieve the same goal as England, where religious and political spheres are kept separate”. “We must try to keep that as our ideal” . Mr. Liaquat Ali Khan then proposed the adoption, as the Pakistan flag, of a dark green flag with a white vertical bar at the mast, the green portion bearing a white crescent in the centre and a five-pointed white heraldic star. Representatives of the Hindu minorities asked that more time should be devoted to the choosing of the flag, and that the minorities should be more closely associated with it. They were, however, overruled, and the proposal was carried. 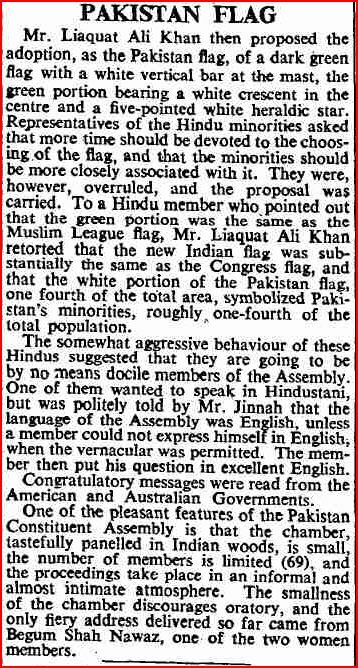 To a Hindu member who pointed out that the green portion was the same as the Muslim League flag, Mr. Liaquat Ali Khan retorted that the new Indian flag was substantially the same as the Congress flag, and that the white portion of the Pakistan flag, one fourth of the total area, symbolized Pakistan’s minorities, roughly one-fourth of the total population. The somewhat aggressive behavior of these Hindus suggested that they are going to be by no means docile members of the Assembly. One of them wanted to speak in Hindustani, but was politely told by Mr. Jinnah that the language of the Assembly was English, unless a member could not express himself in English- when the vernacular was permitted. The member then put his question in excellent English. Congratulatory messages were read from the American and Australian Governments. One of the pleasant features of the Pakistan Constituent Assembly is that the chamber, tastefully paneled in Indian woods, is small, the number of members is limited (69), and the proceedings take place in an informal and almost intimate atmosphere. The smallness of the chamber discourages oratory, and the only fiery address delivered so far came from Begum Shah Nawaz, one of the two women members.